Sometimes a place will create an indelible visual impression that recurs for years, seeming to well up unexpectedly even after long intervals of separation. As you may have read elsewhere on this site, I have been in residence at the Cill Rialaig artists' retreat in County Kerry, Ireland on two occasions. I have also been working to reconstruct my ancestry, which happens to have deep roots in the area of Kerry where Cill Rialaig is located. In the modern world it's difficult for us to imagine the experience of societies inhabiting a place for millenia, societies where your ancestors would have known the same hills and weather and smells. There must inevitably have been claustrophobic aspects to this, but there would also have been a sense of place woven with tremendous emotional resonance. 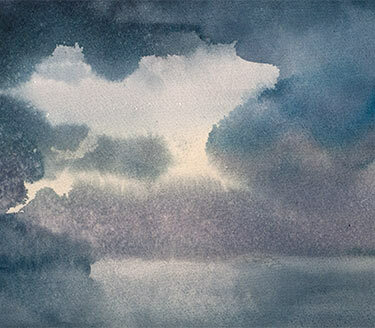 The watercolor paintings that follow are spontaneous imaginings, driven by mysterious yearnings. The titles are in the Irish language, which was nearly obliterated by centuries of British occupation but has enjoyed something of a rebirth in recent decades.